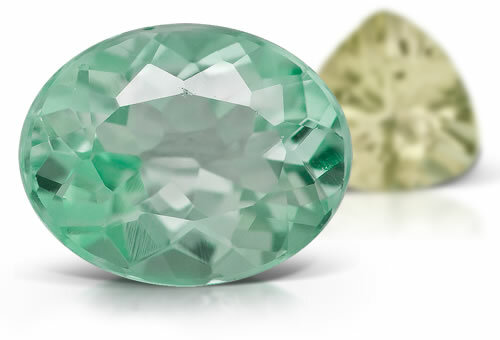 Amblygonite is quite possibly one of the most beautiful pastel colored gemstones that you may have never heard about. It belongs to a class of minerals known as phosphates and forms a solid-solution series with montebrasite. Industrial grade amblygonite isn't that rare; however, when it comes to facet grade material, it quickly moves up on the hard-to-find list. Colors for amblygonite include pale yellow to greenish yellow and various shades of green to blue. On rare occasions, pink to light purple specimens may be found. Colorless material also is available. RI, birefringence, optic character, SG, fluorescence. Amblygonite might show liquid inclusions has a screen like appearance. Stones might also have a hazy parallel bands along the cleavage planes.